This morning stated with a phone call to let us know our room service was being delivered ... a VERY effective wake-up call!) Then we went to a strength and flexibility workout with jenny in the Solarium. It was a crazy windy morning -- so much so that the staff were tying down the deck chairs agains the wind. We struggled to hold on to our towels and our balance as Jenny led us through a circuit of 10 do-anywhere exercises -- a nice way to start the day. For most of the day we took things pretty easy -- eating TOO MUCH (including a second breakfast with John and Jenny after the workout, where we had a chance to catch up. our first towel animal of the cruise! Other daytime highlights: submitting our predicted times for the events, picking up tickets for the ice show in a few days, trying the drink of the day -- a Bahama Mama -- at 11am, somehow eating an enormous salad at lunchtime, hoping for champagne at the "champagne art auction" and just giving up because the art was so terrible, deciding instead on 2-for-1 margaritas at what was to become "our" bar, Boleros, and a well-deserved nap. Dinner was formal, so we gussied up and were seated with Gary and Leshia -- the folks who had read the blog. It's so fun tat these trips to have a chance to talk to other runners about the race they've run, where they're running next, etc. Wil and I left dinner early because ... well, because today was the Super Bowl. So we watched the last few minutes of the first half, the halftime show (giant tiger puppet? heck yes, Katy Perry! ), and then a short part of the second half. Why only a short part? Because we had a NIGHT run to do!!! 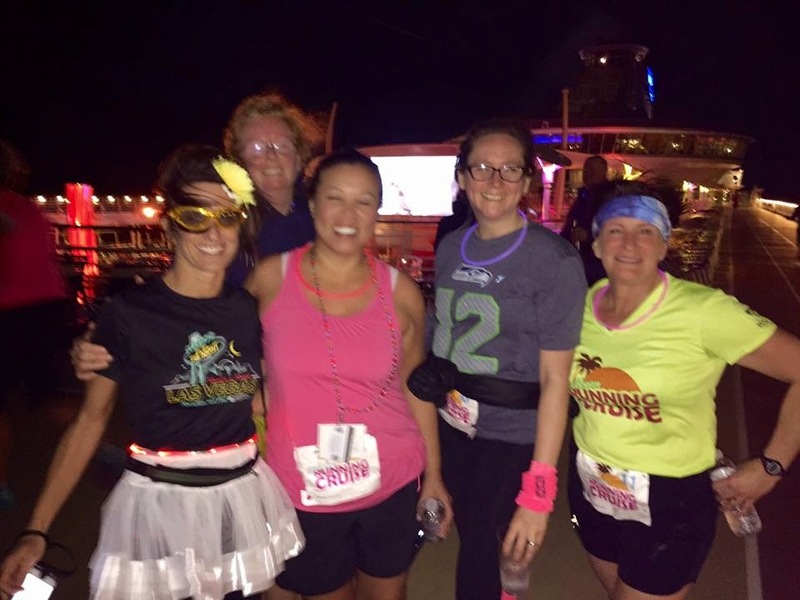 Originally planned as an early morning event, the timing shifted to accommodate schedules and became the first ever SUNDAY NIGHT LIGHTS" run, complete with glow necklaces. Wil and I wore Seahawks gear (yeah, I know, funny) accented with Brite Pink Brooks calf sleeves and armwarmers. Because it was dark and Very Very Windy, the rules were adapted -- folks could run together, time themselves, whatever. John and Jenny were surprised that anyone actually showed up, but a bunch of us did! Wil and I decided to run together -- the craziest, windiest three miles we've ever run. As you ran up the starboard side, the nearer you got to the bow, the stronger the headwind. You would just sorta adapt to it as you rounded the bow, but then as you turned to run along the port side toward the stern, the wind would gust and literally pick up your feet -- so much so, that a lot of us nearly tripped ourselves. But then an all-too fast trip down the port side, whooping at the timers, and then we turned along a wall ... where, when you cleared it, the wind would slam into you and knock you slightly sideways. 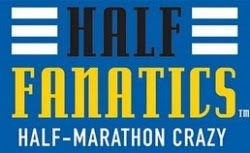 Those of us running the staged marathon distance had to do this THIRTEEN AND A HALF TIMES -- 3 miles. It was pretty ridiculous... but also pretty fun. Then our sweaty, glowing, slightly giddy group went up to Olive or Twist for drinks, and we chatted with BJ & Janet and a few others before heading off for a late-night slice of pizza, some reading, and some writing. Another quiet sea day tomorrow! 2015 Caribbean Running Cruise - we're home!